Tyrone marked their return to Division One with a convincing 0-18 to 1-9 home win over Roscommon. Mickey Harte's men next face Division One champions and All-Ireland holders Dublin on Saturday at Croke Park. Dublin looked impressive as they ran out 0-18 to 0-11 winners over Cavan in front of a big crowd at Breffni Park. A young Donegal side were outclassed by Kerry in Letterkenny although they managed to finish just three points behind. Full-forward Paul Geaney scored both goals for the Kingdom who had corner-back Shane Enright carried off on a stretcher after he was injured in an early challenge with Donegal captain Michael Murphy. Geaney's first-half goal was set up by young corner-forward Jack Savage who looks an exciting prospect for Kerry. The visitors led 1-1 to 1-5 at half-time thanks to a run of five points without reply. Geaney's second three-pointer had Kerry up by 2-14 to 0-8 but, with the visitors bringing on six subs, Donegal stuck to their task and in the end there was just a goal between the teams. 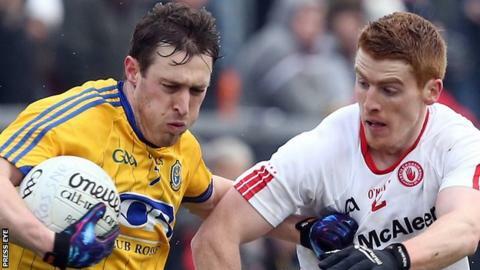 Ulster champions Tyrone were stunned by Niall Daly's early goal for Roscommon but recovered to win with ease. Mickey Harte's men lost All-Star Mattie Donnelly early on, and he looks likely to miss the clash with Dublin due to concussion. They moved into a four-point lead by the 25th minute, with Peter Harte, Darren McCurry and Niall Sludden making them tick. Roscommon went 17 minutes without a score, before Donie Smith landed an excellent point. Once again, a fast-moving Red Hand side got going, with wing backs Tiernan McCann and Johnny Munroe pushing forward to score, while Harte's fourth, and first from play, sent them in with a 0-10 to 1-2 interval lead. Smith fired over two wonderful scores inside two minutes after the restart to kick-start Roscommon's challenge, but they continued to pay a price for indiscipline at the back, with Ronan O'Neill knocking over a couple of frees. Tyrone's point scorers in the game were Harte 4, O'Neill 3, Sludden 2, McCurry 2, Mark Bradley 2, McCann, Munroe, Colm Cavanagh, Conor Meyler and Conall McCann. Dean Rock landed eight points for Dublin as they ran out seven-point winners over Cavan in front of a crowd of more than 16,000. Seanie Johnston, who finished with five points, helped Cavan take an early lead but scores by Rock, Kevin McManamon, Jason Whelan, Ciaran Kilkenny, Niall Scully, and Jack McCaffrey saw the Dubs enjoy a 10 points to seven interval advantage. Dublin extended their lead to 0-16 to 0-10 and late scores by Brian Fenton and Cormac Costello saw them win with ease ahead of next weekend's showdown with Tyrone.